Frame rightly reacted to Dolezal’s Thomism, but more so the fact that Thomas’s view of God is like a solar disc whose rays never actually reach creation. Sure, Thomas can say things like God’s knowledge creates realities. And that’s good, but it never seems to really “fit” with the whole system. Is “I am Essence” the same thing as the God of the Burning Bush? Shouldn’t Thomas’s complete ignorance of Hebrew and passing ignorance of Greek discredit some of his ideas about God? I mean, he bases exegesis of Scriptural texts off of Latin word studies! That doesn’t mean Personal Theism is correct. I have problems with saying God is *in* time (not sure if Frame even says that). But for us who read Hebrew and the Semitisms in NT Greek, we aren’t obligated to agree with Reformed Thomists. by John Frame. Presbyterian & Reformed Publishing, 1995. This is my second time to read through this book. The question obviously arises: should you read this book or Bahnsen’s book on Van Til? They are two different books dealing with two different approaches. Bahnsen’s book is a manual on Van Tillian apologetics, but has relatively little on Van Til’s actual theology. That is where Frame’s is valuable. This is Frame’s favorite aspect of Van Til’s thought, and probably the best section in the book. This is another way of saying God’s aseity. God is sufficient in himself. From God’s self-containment, we may say that God’s unity implies his simplicity: “If there is only one God, then there is nothing “in” him that is independent of him” (55). How does God’s revelation play into this? Due to the richness of God’s nature, we could never know him left to ourselves. However, if God, a self-contained God–and a self-contained God who meets the standards of immanency and transcendence, reveals himself, then we have certain, sure knowledge of who this God is (transcendence) and how his revelation applies to concrete situations (immanence). God is the original and man is the derivative (Christian Theory of Knowledge, 16). By analogical we don’t mean what Aquinas meant. Our knowledge is a finite replica of God’s (Introduction Systematic Theology, 206). Non-Christian systems die on the altar of personality. Either they posit personal, but finite gods (Greek pantheon) or impersonal, infinite gods (Eastern religions). Only Christian theism posits a personal, absolute God. They do so because of the Trinity. To quote CVT, “the members of the trinity are exhaustively representational of one another” (qtd. Frame, 59). To end this section with a quote and call to action from Frame, “Impersonal facts and laws cannot be ultimate, precisely because they are not personal. They cannot account for rationality, for moral value, for the causal order of the universe, or for the universal applicability of logic” (60). Ah, this is where the heresy charges come in! And given the renewed interest in Trinitarianism, this section can be very useful. Van Til begins by stating and affirming what the Church has taught on the Trinity. His position can be summarized in the following moves: Trinitarianism denies correlativism, the belief that God and creation are dependent on one another. God is three persons and one Person. Watch closely. He calls the whole Godhead “one person.” He is not saying that God is one in essence and three in essence. The main question is “the one being personal or impersonal?” (67). Van Til is calling the whole Godhood one “person” in order to avoid making the essence of God to be merely an abstraction. Frame argues, “If the three persons (individually and collectively) exhaust the divine essence (are “coterminous” with it), then the divine essence itself must be personal” (68). And if God is an absolute person (he is), and he is one (he is), then there must be a sense in which he is a person. Granting the Augustinian circumincessio, every act of God is a personal act involving all three persons acting in unity (68). I think Rushdoony was more excited about this than Van Til (see Van Til’s response to Rush in Jerusalem and Athens). How do we find unity in the midst of plurality? Unbelief cannot answer this question. It always tends toward one or the other extreme. If abstract being is ultimate, then there are no particulars. If abstract particular is ultimate, then there is no truth. The Trinity is both personal one and many. If all of reality is one, then how can we make distinctions? If all of reality is just sense data, how can we unify them in our consciousness? We are faced with the danger of either pure abstraction or pure matter. Frame has a very good discussion of this on p.73. Contrary to popular opinion, Van Til does hold to general revelation. Given his view of God’s sovereignty, all things reveal God’s decree. (Man is receptively reconstructive of God’s revelation. It is his job to re-interpret previously God-interpreted facts.) In short, Van Til holds to the typical Kuyperian view of revelation. From this Van Til posits a three-fold division in God’s revelation: a revelation from God, from nature, and from self (120). This is perspectival, btw. As to Scripture, it is self-attesting and bears God’s full authority. As such, it must be inerrant. CVT does not disparage the use of evidence, many critics to the contrary. Rather, he denies the use of “brute facts.” Given the Trinity, all facts and laws are correlative. Brute facts are “uninterpreted facts” and therefore meaningless, the constituents of a universe of pure chance. This means we cannot separate facts from meaning. We cannot challenge the unbeliever on a particular fact if we do not challenge his philosophy of fact. Again, see RJ Rushdoony on facts and evidence (JBA). Van Til’s contribution to this debate is that he puts common grace on a timeline, emphasizing “earlier” and “later” (CGG, 72). Van Til makes the interesting point that common grace decreases as time goes on. “Differentiation sets in” (83). Frame questions this as he does not see the world necessarily getting more and more wicked. Frame is partially correct but he resists the inference Gary North will draw. Frame thinks North reads too much into the word “Favor,” which is ambiguous in English. Perhaps he does, but North’s argument is still the same: we should speak of common gifts instead of common grace. God gave the Caananites an extra 40 years. This was a gift. Was it “favor?” No, he ethnically cleansed them 40 years later. And Van Til, pace Frame, is very clear on the timeline. As history progresses God will withdraw his common grace from the wicked, and show his love towards his children by watching the wicked wipe them out (or so reads Van Til’s timeline). Frame avoids the postmillennial challenge: if the unbeliever is epistemologically self-conscious, he can’t function logically, so how can he have dominion? 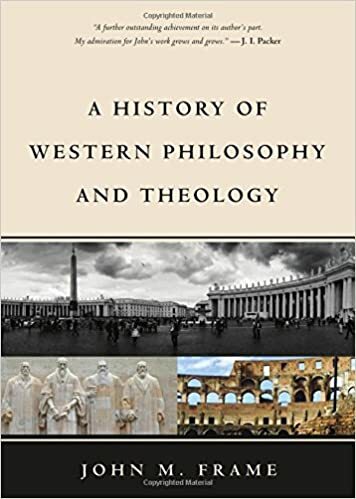 There are also chapters dealing with Barth, Dooyeweerd, and the theonomists. They are well worth your time but beyond the scope of this review. A fitting end to a fine series. This isn’t Frame’s best work ever (that would either be DG or DCL) but it is good and there are legitimate reasons for this volume’s limitations. Frame wanted to get his book on Scripture out, but he also suspected he might die beforehand. So he gave a shorter version of it. The first 330 pages deal with a perspectival doctrine of Scripture. The last three hundred are book reviews. Scripture is an organic revelation, but Frame doesn’t mean by organic what 19th century pantheists supposedly meant. For Frame, “Revelations in Scripture, world, and self presuppose and supplement one another; one cannot understand one of them without reference to the others” (Frame 350). Frame’s book isn’t just another book on Scripture and how it is inerrant or from God or something. Rather, it calls forth our obedience, and this ties with the above thesis: “Every obedient response to Scripture involves knowledge of creation and self” (364). For example, whenever I reason about or from Scripture, that presupposes I know what logic is and how to use it. “The main contention of this volume is that God’s speech to man is real speech” (3). Authority: the capacity to create an obligation in the hearer (5). God’s relation to us is always covenantal, so we should expect a written, covenant document (108). A canon naturally arises because we need to record God’s spoken words to us, and our God is a God who speaks. (5) Revelation of God’s institutional provisions. Covenantal revelation is both personal and propositional (153). God reveals his Name, but he does so in propositions (and sentences and declarations). Our relationship with God is covenantal, and in covenants God speaks to his people (212). Some of the chapters were quite short and I wish Frame extended his analysis. However, the book reviews show remarkable analysis and depth. See especially his reviews of Enns and Wright. If you have read Frame before, then you know what you are getting: carefully argued positions, fair treatment to opponents, and a staggering amount of biblical reflection. His tri-perspectivalism is on display here, as in earlier books. I will address it as the review moves forward. He defines ethics as “living under God’s law, in God’s world, in the presence of God himself” (Frame 3). Further, these are Lordship ethics, and Lordship has three attributes: 1) Control: 2) Authority 3) Covenant presence. He begins with a description of ethics and a brief (too brief, perhaps) survey of autonomous ethics. He notes that autonomous ethics are hamstrung by rationalist/irrationalist dialectic: man proclaims his own reason as the standard yet denies it is able to reach knowledge of God. Following this he gives a commentary on the Decalogue, noting key particular applications. I am not going to give a summary of each commandment. Rather, I will note some of his more controversial claims, his more helpful sections, and other notae bene he makes. RPW advocates see three categories for what is biblically permissible: 1) express commands, 2) approved examples, and 3) theological inferences. Well and good, but adding these extra categories mitigates the simplicity of the RPW. Even worse, it “gives considerable scope for human reflection, in even determining ‘elements’” (471). What about temple worship? Not everything in the temple was typological of Christ’s sacrifice. It had prayer, teaching, and praise, yet these weren’t abrogated. On the sixth commandment he gives an eloquent, and quite frankly emotionally-moving, defense of the unborn, with some interesting history on Operation Rescue. On sexual ethics he points out the naturalistic fallacy in the Roman Catholic arguments against *some* birth control methods. In his discussion of the Decalogue he hints at a rebuttal of Kline’s “Intrusion Ethics.” Kline argued that some of God’s more extreme measures (Canaanite genocide) are actually intrusions of God’s final justice. Well, yes and no. True, that was a positive command and not to be repeated by the church today. Frame notes that we “do not see biblical evidence of an ‘order’ or ‘sphere’ of common grace” (535). Is this a time or sphere of common grace? But even if it is, God’s blessings fell upon elect and non-elect within theocratic Israel. Is Kline talking about government? Perhaps, and a holy government is one that bears “the divine name” and “the promise of being crowned with consummation glory” (Kline, Kingdom Prologue, 96). But does Scripture ever describe a government as such? Israel is a “chosen people,” to be sure, but is the nation itself promised with consummation glory? In any case, as Frame notes, nothing in Genesis 4-9 suggests a distinction between holy and nonholy governments (536). And even if it did, that wouldn’t help explain how the modern magistrate, who might happen to be a Christian, is to rule. What does it mean to rule according to common grace? How could we even determine which application of “common grace” is more “gracey” or right than the other one? General Franco of Spain probably had more common grace than either Hitler or Stalin, yet one suspects that the modern advocate of intrusion ethics wouldn’t praise Franco’s regime. While wanting to avoid “anti-abstractionism” in theology, theologians shouldmake use of one of the most important theological words there is–merely. While God is a God of mercy, he is also a God of justice. He is not merely a loving God, but also a just One. The dualism critique often becomes…a word-level rather than a sentence-level critique. Critiques of dualism usually are arbitrary critiques of terminology that an author does not himself employ. If the critique is engaged on the sentence-level and is forced to deal with the content of the propositions then the possibility of arbitrary critiques is lessened. In other words, it is a critique of the author’s vocabulary and not of his ideas. How are non-orthodox positions “systematically vague?” Can you give a example? Non-orthodox (and non-Christian, for that matter) positions cannot balance or account for truths or doctrines that do not fit their own paradigm. For example, non-orthodox positions cannot simultaneously account for transcendence/immanence and in honing in on one, they miss the other. Practically speaking, this means that if the positions takes an immanence view of God, for example, they will take a rationalistic view of the world. In doing so, they cannot account for patterns or facts that do not fit their own (usually arbitrary) paradigms. Discuss values, dangers in labeling. Labels allow one to state a position succinctly. Theologians do not always have the time to outline the uniqueness of x position. If we understand that labels are descriptive nouns then our very act of describing this theological position or that theologian’s beliefs is “labeling.” However, labeling can often degenerate into judging a theologian on the merits of what others in his “group” rather than in what he is saying. Furthermore, labeling often does not do justice to one’s position. One might be a “fundamentalist,” broadly defined, but there is more to the position that was not said, etc. Thus we may think we have a clear idea of the meaning of the term, when all we really have is a feeling.” Discuss, Try to think of an example. We often make judgments based on what we think a word or phrase means without knowing its proper biblical and historical context. Words and phrases, furthermore, have “fuzzy boundaries.” Placed in context a doctrine x certainly sounds wrong, but the doctrine x is not always wrong. Orthodox theologians wince at God repenting, but seen in the covenantal context at Sinai it is then biblically correct to say that in a way God did repent. We rightly feel that making this an absolute truth about God’s immutability is wrong, but if we see the biblical and covenantal context that it is in, then it is correct. What methods will help us to recognize ambiguities? Young theological students are encouraged to make theological lists of what a word or phrase can and cannot mean. This will help interpret the author fairly if one examines all that a phrase can mean and then decide, in the best light, what the author probably means by it. Then, one must point out what that language is not air-tight. As language is not air-tight, the systems that are made up of language are not air-tight, either. A sentence is not necessarily always true or false. Knowing this will keep the theologian from passing judgment until he has seen the best of what could be meant by a phrase. Why the linguistic turn in recent philosophy and theology? As philosophy continues to search the deep questions of life, it will (most likely) keep asking the same questions, with little progress. To counteract this weariness, philosophers have begun to wonder if their lack of progress is due to a lack of clarity in language. Many philosophers are seeing language as the key to reality. This is true, but it is not the only key. However, language does describe the world and the better the use of language, generally, the more useful one will be in describing reality. Language is an indispensable element of the image of God. Expound. God communicates to man by his word. God created the world by “word of his power.” Jesus is the Word of God. Man’s cultural mandate involves the use of language to describe and dominate reality. Conversely, sins of the tongue are sternly warned against in the Bible. Again, Scripture’s vagueness disallows ultimate maximum precision and secondarily, it makes unwise to force subscription to a document that implicitly seeks to be more precise than the standards God Himself set. Thirdly, such maximum precision and subscription unconsciously makes the Confession irreformable and canonical. Sometimes, metaphors come to our rescue in theology. Metaphors, especially controlling ones, state thorny theological concepts in a s ccinct manner. This presupposes, of course, that vagueness is not only in Scripture, but vague statements about Scriptural truths are allowed. For example, how does one view the relationship between Adam’s sin and the human race? The best example, although one in need of qualification, is the “Federal Headship” of Adam. Adam represented the human race as a Federal head. Often, in fact, figurative language says more, and says it more clearly, than corresponding literal language would do. Figurative language allows one to use popular concepts on the lay level to express truths. For example, it is clearer to say “God is like a mountain, unmoved” than to say “God is immutable.” The latter is more precise, whereas the former is able to communicate the same truth on the lay level. Use of a metaphor may be helpful in one context, misleading in another. Discuss, using examples. Frame suggests that it is best not to use metaphor unless its purposes can be clearly expressed and limited. An example is the Dooyeweerdian definition of law as the boundary between God and the Cosmos. This is good in one sense but raises the question as to what degree does law limit or not limit God. In what sense, then, it is a boundary? Discuss possible cases in which there is danger in using metaphors when more literal language is necessary. Either certain metaphors must be “unpacked” or more technical terms must be used. In other words, uninterpreted metaphors must not be used in philosophical, legal, or scientific discourse. Everything is analogous to God to the degree that all creation bears God’s imprint on it. God is like a “fire,” “wind,” “Lion of Judah,” “king,” “love,” etc. But for every analogy there is a disanalogy. God is analogous to evil men (or rather, they to him being created imago dei) but not in the same way that he is analogous to righteous men. That is, there are degrees of analogy between God and creation. Do we need special technical terms to refer to God’s transcendence? Discuss. Technical terminologies concerning God’s transcendence are helpful but their uses ought not to be pressed. It is helpful to know the “qualitative difference” between God and men, for example. The same principle applies to God’s omnipresence, omniscience, and omnipotence. These terms are true as far as they go, but Scripture does not describe God in this way, preferring human referents: Lord, King, Saviour. Many doctrines have been formulated by way of contrast with heresies. Negation, like Scripture, seeks to contrast truth with error. Many doctrines, such as creation ex nihilo, seem to be most meaningful as an exclusion of contrary heretical positions. The nature of negation in theological formulation, however, is limited. Negation seeks only to show why or for what purpose doctrine x serves. Examples are, as Frame points out, the Reformation Confessions against sectarianism and Romanism, Nicene Trinitarianism against Sabellianism and Arianism, etc. …some doctrines have very little meaning except for their negative function of exclusion. The denial of various heresies constitutes the meaning of a said doctrine. Given tough, philosophically vague concepts like substance, nothingness, hypostasis, it is difficult for the theologian to state a doctrine positively from Scripture. However, a Scriptural case can be built inferentially from negation. Everything is a matter of everything else. Discuss. We must be aware of using “historical disjunctions” to deny other theological truths. For example, while doctrine x is true, it does not necessarily follow that doctrine y must be false. There are degrees to which each doctrine is related and not related to the other doctrine, to be sure, and these degrees of relation ought to form a framework in which to evaluate those doctrines. This review is dedicated to Kevin Johnson. I won’t give a whole review of each thinker in this book. I’ve done some of that here. What new material can a survey of Philosophy cover? I was wrong. Frame’s text has numerous ‘lagniappe’ that you won’t find in other texts (links to audio, references to modern Reformed thinkers, etc). In other words, it’s fun. But more importantly, it’s conducive to piety. Frame defines theology as the application, by persons, of God’s word to all of life (Frame 4). Sure, there is a Kuyperian thrust and that can be abused, but on the whole I appreciate it. He reduces metaphysical discussions to: Is reality One, Many, or Both? (Hint: It’s both). *God is absolute tri-personality (16-17). He relates to his creation in terms of Lordship. Lordship is explained as authority (normative), control, and presence. I think this is a good move, but there is a subtle anti-substance metaphysic involved. Substance metaphysics would usually say that reality is “cut at the joints,” meaning a universe of parts, whole, etc. That’s fine as far as it goes and few would disagree. Traditionally, though, that concept would get applied to God. Frame (perhaps subconsciously) does not allow that. We aren’t now speaking of God’s transcendence in a way that he is spatially “above” or separated from the universe (though certainly not identical with it). The language is no longer spatial, but covenantal. Frame’s account is light on early philosophy and focuses more on early modern and recent philosophy. His thesis: The two renaissance themes–humanism and antiquarianism–couldn’t be integrated. Do we gain knowledge by reflecting on the past or do we gain knowledge by using our autonomous reason divorced from tradition (167)? Presented alternatives in metaphysics and epistemology. Luther: in his metaphysics he turned away from the NeoPlatonic “One” and back to the absolute and personal God of revelation (169). Calvin marks a new move: he begins his Institutes with the knowledge of God. Knowledge of God is never apart from reverence and love towards him. This also determines man’s self-knowledge: “how can we imagine knowing anything without knowing ourselves, that is, knowing our knowing” (Frame 173 n16)? Calvin’s epistemology breaks with Renaissance and medieval models. Correlated with Calvin’s absolute personal theism. After the Enlightenment, Frame makes the rather strange suggestion that the two worst heresies the church faced are Deism and Liberalism (220). I…um…don’t know about that. But it does explain much of the book. He defines liberal as anyone who doesn’t submit to the authority of Scripture (216ff). This definition of liberalism is very important for Frame’s text and it allows him to misinterpret a number of key thinkers. Frame has a magnificent chapter on Kant and Hegel. Without explaining Kant’s philosophy, it allows Frame to make another important observation: the conservative drift in liberal theology. Liberals began to use more conservative language while retaining liberal constructs. His chapter on Barth is just bad. I’ve blogged on it elsewhere. His take on Pannenberg is slightly better, though ruined by Frame’s definition of liberal theology. Pannenberg is not a liberal just because he doesn’t hold to inerrancy. But when Frame sticks to material in which he is an acknowledged authority, such as linguistic analysis, he shines. The chapters on Russell and Wittgenstein were outstanding. He ends his text with a survey of recent Evangelical theologians. Should you buy this text? I think so. It has a number of drawbacks and he only rarely engages in more than a surface-level analysis, but it is better than most one-volume treatments. Frame includes annotated bibliographies, pictures, diagrams, and links to audio lectures.